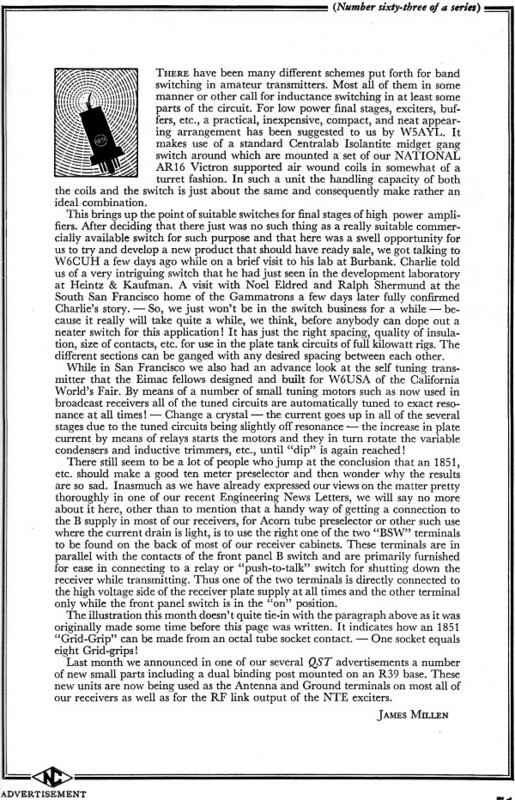 National Company, a major manufacturer of radio components, ran a very long series of advertisements in QST magazine that were in a format more reminiscent of a short essay than a company promotion. This installment for the May 1939 edition was number 63 (I have one numbered 224 from December 1952). Subjects ran the gamut from technical innovations from the company's research and development laboratory to social and political issues relevant to electronics technicians, hobbyists, students, and engineers. Here, company president James Millen explains the research and motivation for developing a new inductor switching arrangement for band switching. 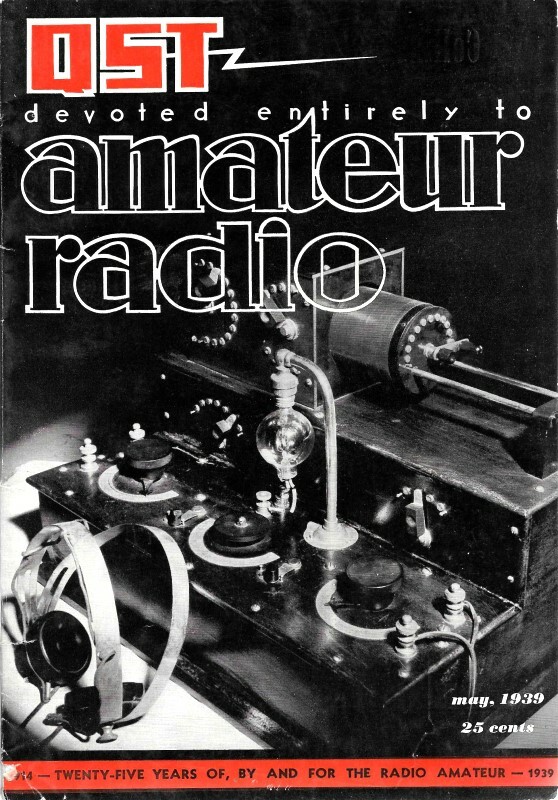 Advice from active amateur radio operators was included in the process. 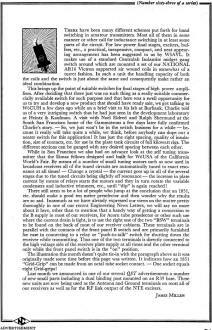 There have been many different schemes put forth for band switching in amateur transmitters. Most all of them in some manner or other call for inductance switching in at least some parts of the circuit. For low power final stages, exciters, buffers, etc., a practical, inexpensive, compact, and neat appearing arrangement has been suggested to us by W5AYL. It makes use of a standard Centralab Isolantite midget gang switch around which are mounted a set of our National AR16 Victron supported air wound coils in somewhat of a turret fashion. In such a unit the handling capacity of both the coils and the switch is just about the same and consequently make rather an ideal combination. This brings up the point of suitable switches for final stages of high power amplifiers. After deciding that there just was no such thing as a really suitable commercially available switch for such purpose and that here was a swell opportunity for us to try and develop a new product that should have ready sale, we got talking to W6CUH a few days ago while on a brief visit to his lab at Burbank. Charlie told us of a very intriguing switch that he had just seen in the development laboratory at Heintz & Kaufman. A visit with Noel Eldred and Ralph Shermund at the South San Francisco home of the Gammatrons a few days later fully confirmed Charlie's story. - So, we just won't be in the switch business for a while - because it really will take quite a while, we think, before anybody can dope out a neater switch for this application! It has just the right spacing, quality of insulation, size of contacts, etc. for use in the plate tank circuits of full kilowatt rigs, The different sections can be ganged with any desired spacing between each other. While in San Francisco we also had an advance look at the self tuning transmitter that the Eimac fellows designed and built for W6USA of the California World's Fair. By means of a number of small tuning motors such as now used in broadcast receivers all of the tuned circuits are automatically tuned to exact resonance at all times! - Change a crystal - the current goes up in all of the several stages due to the tuned circuits being slightly off resonance - the increase in plate current by means of relays starts the motors and they in turn rotate the variable condensers and inductive trimmers, etc., until "dip" is again reached! There still seem to be a lot of people who jump at the conclusion that an 1851, etc. should make a good ten meter preselector and then wonder why the results are so sad. Inasmuch as we have already expressed our views on the matter pretty thoroughly in one of our recent Engineering News Letters, we will say no more about it here, other than to mention that a handy way of getting a connection to the B supply in most of our receivers, for Acorn tube preselector or other such use where the current drain is light, is to use the right one of the two "BSW" terminals to be found on the back of most of our receiver cabinets. These terminals are in parallel with the contacts of the front panel B switch and are primarily furnished for ease in connecting to a relay or "push-to-talk" switch for shutting down the receiver while transmitting. Thus one of the two terminals is directly connected to the high voltage side of the receiver plate supply at all times and the other terminal only while the front panel switch is in the "on" position. The illustration this month doesn't quite tie-in with the paragraph above as it was originally made some time before this page was written. It indicates how an 1851 "Grid-Grip" can be made from an octal tube socket contact. - One socket equals eight Grid-grips! Last month we announced in one of our several QST advertisements a number of new small parts including a dual binding post mounted on an R39 base. These new units are now being used as the Antenna and Ground terminals on most all of our receivers as well as for the RF link output of the NTE exciters.